As many of you probably noticed, last Sunday (7th of April 2019) was a big day for Flemish people as the 103rd Tour of Flanders took place. As always there were a lot of supporters along the Flemish roads to watch the cyclists give their best. This year, there was something new. Telecom operator Proximus used mobile phone signals from the spectators to track the movement of the mass. This is useful for the police so they can have a good insight into where most of the people are located. In that way, they can get reinforcements where needed in real-time. To do so they use a heatmap. The heatmap shows the data from those mobile phone signals in order to track where the most people are located. Places with a big population have a warmer color (eg. Red) and places with less people generating mobile phone signals have colder colors on the map (eg. Blue or green). Map of the Flemish Ardennes: the two red dots mean that there are a lot of people in that place. In the Crisis center they can decide live whether they need more or less police officers to control the crowd. It’s not the first time that Proximus used mobile phone signals to track movements of a crowd but it has never been on this scale. This is the biggest real-time crowd management they ever did and that has ever been measured in Belgium. Approximately 800.000 people have been tracked by their mobile phone signals. Note that this is all aggregated data, which means that mobile phone signals are not being tracked individually. Are you interested in similar visualizations for your business or use case? 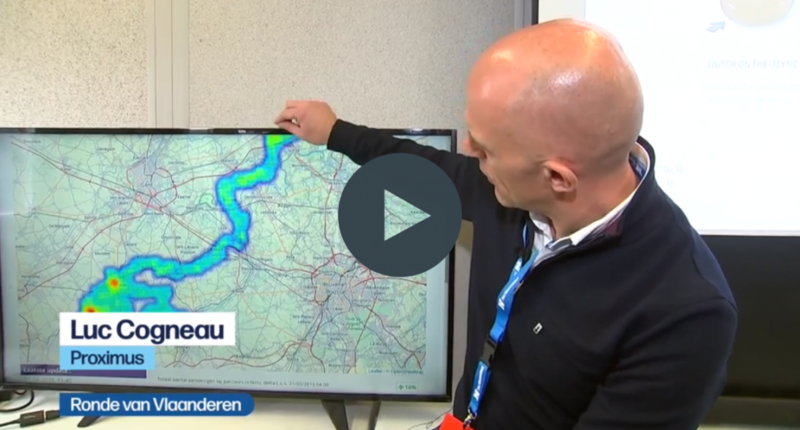 The data of the Tour of Flanders crowd was visualized by the software of Cumul.io.